Press the arrow buttons to select Copy and press the OK button. 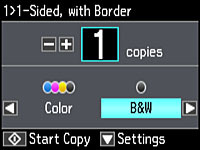 To print more than one copy, press the + or – button to select the number (up to 99). Press the right or left arrow button to select Color or B&W. Press the down arrow button, then press the OK button to view and change additional copy settings, if necessary.